I left the hotel to find something to eat and along the way there was a food truck called Mr. Shwarma. The wrap was so delicious on Friday that I was drawn back there the next day to try the lunch box. If once is good, twice must be better. I ate outside of the subway station, sitting on an iron bench and watching a small green commons, idling noticing the different kind of pigeons that were poking in the grass. A man came along with a cart into which one might normally put their groceries if they were carrying them home. 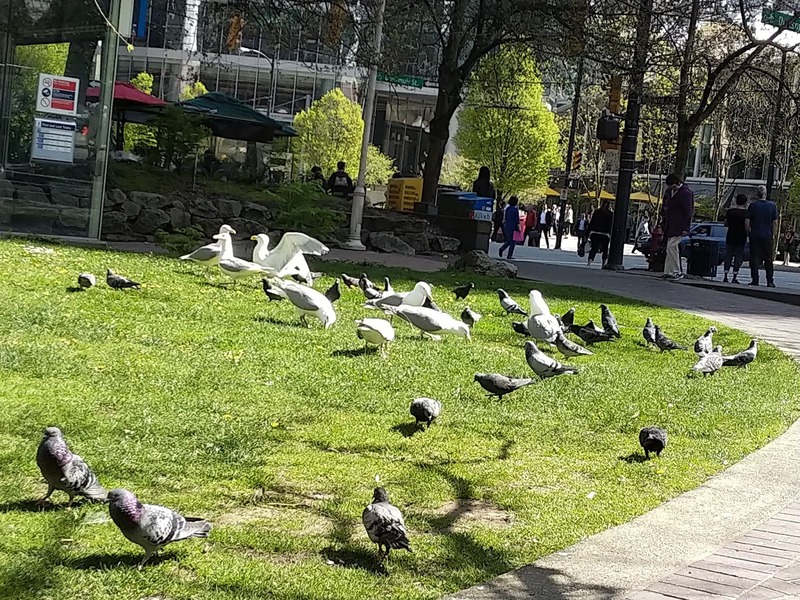 But he brought out bags of bread crumbs and spread them out for the birds. And now I could see the real pecking order of the gulls, for suddenly the big white ones flew in and the others hopped aside to let them finish before they proceeded to get their fill. 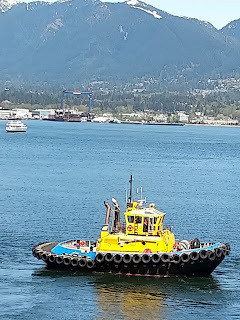 I watched a yellow tug in the harbour. I didn't ever see the load it was pulling. I watched the rope snap forward and back. The tug didn't seem to be making any progress. I began to wonder what size of load it was carrying. But when in Vancouver, it is not a good idea to stand and watch too long, for there is too much to see. Still I had to take a picture to prove to myself that there was a little yellow tug and that it didn't seem to get too far. What an iconic picture. A tugboat with mountains in the back. Wished I was there with you with a toddler to look at it. But alas, my toddler days are over. And that is OK. Yes, a picture that would be in a child's book: ages 1 - 3. And I had to stand and watch the yellow tug. Maybe it is the primary colour that was so interesting to me. The warf was long and I couldn't see what it was that was so hard to pull. I couldn't even imagine what the cargo would be, out on those waters that lead to the ocean. I only see logs coming down to Canoe outside of my window when I look at the Shuswap.